Deborah Jenkins became executive vice president & head of Freddie Mac Multifamily in November of 2018. 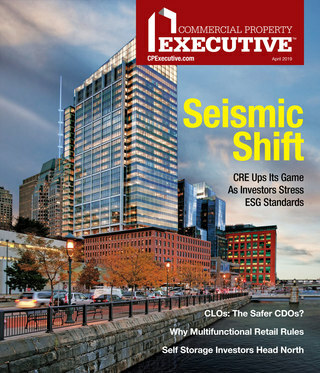 CPE sat down with her at the MBA CREF conference to talk about Freddie’s record-breaking year and forecast for 2019, its new seller-servicer branding campaign, and the innovations it hopes to bring to the industry this year. 2018 was a record-breaking year for Freddie Mac. To what do you attribute that volume? Jenkins: It was another record year: $78 billion in overall volume and the fourth year in a row we have led the industry in that area. Also, $73 billion in overall securitizations, which was also a record. And a 7 percent growth rate on both originations and securitizations. We basically grew in lock-step with the overall multifamily origination market. Our estimates between 2017 and 2018 show right about that 7 percent growth rate in overall volume and that is really attributed to just the success of our model and our platform, which is the risk-transfer model, which moves over 90 percent of the credit risk to private capital and away from taxpayers, and allows us to enjoy a lower cost of capital. Lastly, I would say it’s mission-related success as well as we continue to innovate with workforce housing—that missing middle. Everything that we are doing to innovate in that area is really based on that mission. Tell me about your efforts in workforce housing? Jenkins: Ninety percent of what we do, in our entire origination platform, is affordable to workforce, seniors housing and others who are making at or below area median income. It’s really in our DNA. But for last year, by way of a few examples, we got back into the Low Income Housing Tax Credit equity space—deeply restricted rents at very low levels relative to area median income. We were able to do about $500 million in overall commitments in that space (with) a lot of it falling under our Duty to Serve initiative, which includes rural areas where support of this kind is needed. And then our workforce mezzanine program was kicked off, which solely aims at preserving those rents through the term of the 10-year loan. And, there’s our social impact financing: We have a lot of sponsors that are forming equity that will actually allow for a lower level of return than we typically see. The financing terms help preserve or restrict rents for a higher percentage of units. And what do you anticipate for this year? Jenkins: For 2019, more of the same. We are projecting in our outlook about a 3-4 percent growth in overall multifamily market origination. So you will start to see moderation in the growth of the overall multifamily market. Our forecasts and projections for ourselves are relatively flat for next year in the originations space, so we literally plan to grow along with the market to being right in that flat range. The other thing I would say in the workforce housing space, which is the vast majority of what we do, those rent levels and vacancy levels are very, very healthy, and you see (positive) demographic trends—renter preferences, Millennials waiting longer to buy a home, Baby Boomers moving out of their larger homes and back into rental housing, urbanization and all of those things. 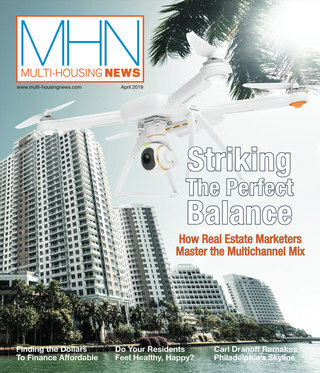 The fundamentals for multifamily look really strong, so we are obviously happy about that. We know that interest rates will not be a disruptor in the near term. Do you see any other risks that could be? Jenkins: Interest rates have been an interesting thing to watch over the course of the last few months. In early November, we saw the Treasury hit 3.24 and, if somebody would have told me it would be in the 2.60-range in February, I would have been very surprised at that. And I think most would be surprised. That volatility that occurred basically in November and December was not a function of the multifamily or the commercial real estate markets. Literally, we saw the stock market fluctuate 1000 points a day and things of that nature. Getting back to the interest rates, with the rates being lower, there is a lot less pressure on cap rates and multifamily prices. Seeing healthy growth in overall multifamily price appreciation in that 8 percent range last year, we feel that is a very healthy clip and we see that continuing. The one thing I would say is, although we see a healthy multifamily market and fundamentals, the things that we cannot control are more global and macroeconomic issues. Tell me about your new Optigo™ program? Jenkins: We rolled Optigo™ out over the last few weeks. We needed to name our origination platform and our lender network. We never really had a name for it. So we figured, with the next era of multifamily and what we are moving into and representing, our lenders deserved a name, as opposed to just being called seller-servicers, which is not overly exciting. Most people say: What is Optigo™? It is a kind of a made-up name and we thought long and hard about it. It wasn’t a decision that was made quickly. It’s two parts: “Opti” and “go.” Our materials say “Optigo™ Further.” What that really means is: “Opti” is the optimal solutions and optimizing the platform. All of those things we’re already known for in the industry. We are known for being creative and innovative in most things. And that is where the “Opti” or optimal comes from. And the “go” is simply: Where are we going and what does our future hold? We create the optimal solutions, and then we go on to making sure things are done for our borrowers and for renters. It also points to the future. We are embarking on our digital transformation—starting actually late last year, which is a multi-year plan to really change the way multifamily mortgages are originated. So Optigo™ is really about us going further and optimizing our platform. How do you see originations evolving from a technology perspective? Jenkins: We are taking the opportunity to look at every aspect of the process of originating all the way through securitization and servicing of multifamily loans and saying: Where is it that we could actually use machine learning, artificial intelligence? Making it so, instead of spending 29 out of 30 minutes staring at and comparing data, you’re actually spending 29 of the 30 minutes analyzing it and being able to make faster decisions. For us and for the industry, it’s more about speed to market and creating efficiencies, so that it is less expensive for a borrower to obtain a multifamily loan and, hopefully, that translates into lower rents for workforce housing. Tell us about your efforts to increase the supply of workforce housing? Jenkins: Every innovation, new initiative, new product and tweak to existing products has that mission in mind. And, honestly, it’s not just a mission—at Freddie Mac it’s more of a purpose. And I think that really differentiates us from other lenders in the industry because that is our North Star. It’s about the products that I just mentioned: the LITHC equity, the mezzanine financing, the social impact and things like that. But, honestly, it’s the lack of supply that is creating the affordability issue. And we’re looking at some ways to help increase the supply of housing for that missing middle and affordable housing piece. The supply that’s being built is generally Class A. As we think about affordable housing, we have to be concerned not only with having it built but also preserving affordability. We have offerings that do this over the life of the loan—so upwards of seven to 10 years. This can ensure that rents stay generally affordable to middle-income and lower-income housing renters. Currently, Freddie Mac does not do construction financing, correct? Jenkins: We don’t. We only do the permanent side. The industry as a whole ought to determine what more can be done to encourage construction financing so that we can move the needle on supply. The answer to this question is crucial to addressing affordability. How will green financing change for Freddie Mac this year? Jenkins: Obviously, we—both GSEs—have seen a big increase in green financing that we have provided over the last few years. To date, up until this year, it’s really has been more focused on water as opposed to the energy savings. And this year, the FHFA made some changes to the requirements of the Green program and is now looking for half of that savings to be in energy. That’s where savings is really passed along to the tenant—when they see their utility bills. So that is where we are focused on doing more and the changes to the green program reflect that.